A part of me kinda died today when I found out BT is going down. But I can't believe the AA community is still on life support. It kind of makes me want to play again. I haven't touched the game since v2.7 killed everything. What was that thread in the old forums called? "Who's still here?" We hope to get an account management system in place, but in the meanwhile everyone is welcome to use their Battletracker info to play as long as the sight is alive. As for who's still here. People. Ordinary people. And then some oddballs. Sweet. I only remembered about AA since a clan that I played with back in 2.6 showed up in a different game I play. Ganja, long time no see! ALright Ganja miss you man. Ahh....the good old days of drop shots on bridge. once again ? 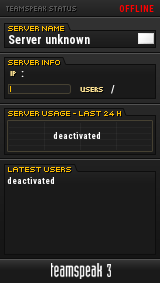 the Another aao25.com Dedicated Server ones are dead and noone wants to play there. hope to keep playing more without problems! Lord - you should maybe choose a protected server to play on. If you need one, you can have it for free on Europe. Let me know what you will do. I'd be up for some bridge whoring.